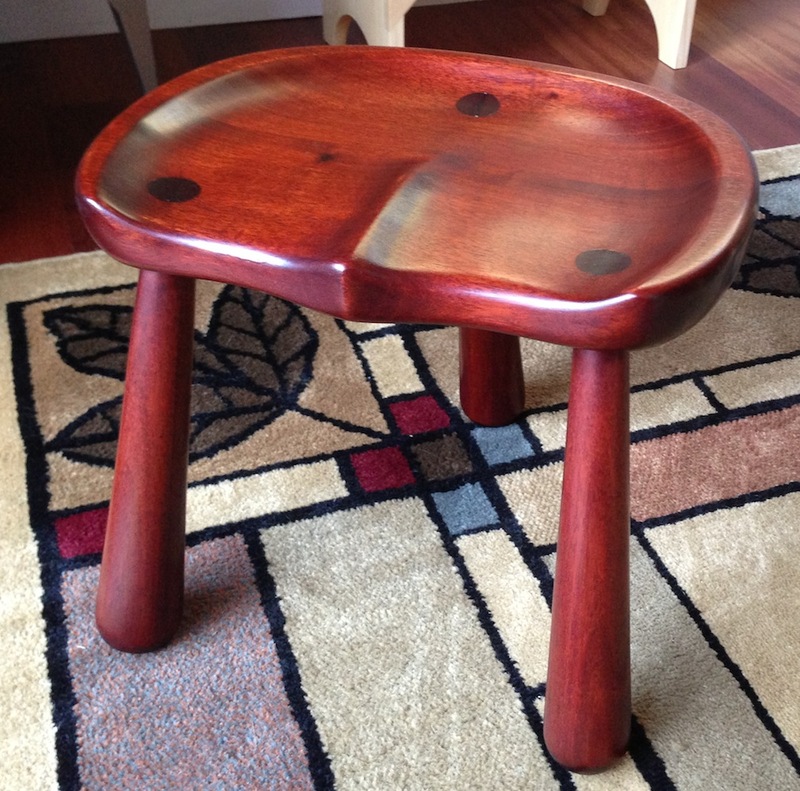 Three Legged Stool – Finished! 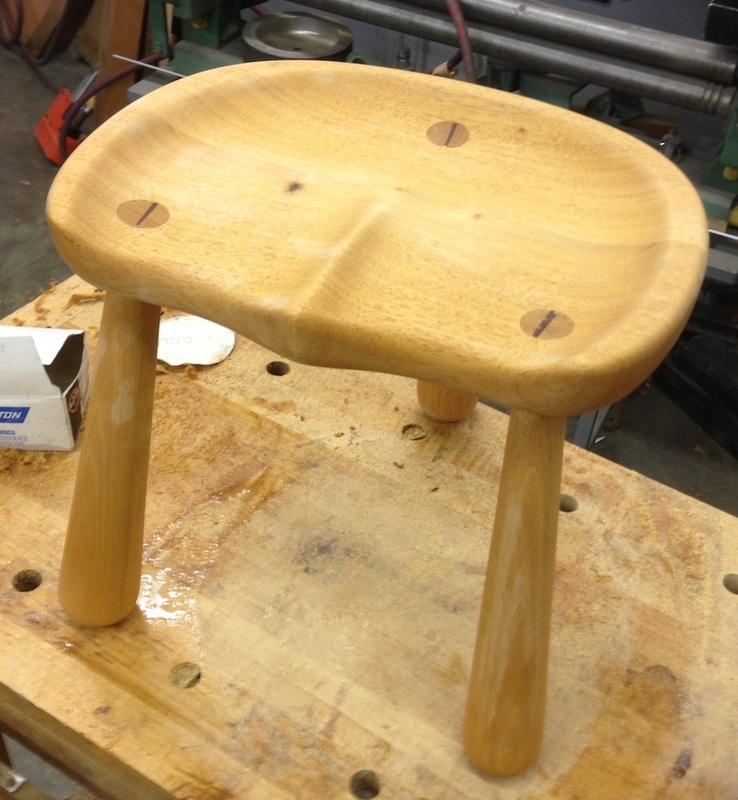 The stool is finished, long live the stool. In the midst of a giant work crisis yesterday and continuing this morning I managed to “steal” a few hours away and finish my little stool project. At the same time I think I set some kind of world record for the number of conference calls attended in a 36 hour period. It was surreal. I was dialed into a meeting roughly every hour from 8 am Saturday morning through 1 am Sunday morning. And two more already today. This is, in fact, part of why I like to make things. It is a great antidote for work stresses. So, on the stool then. I sanded it through 320, sprayed it with water and wiped it down to raise the grain. I left it to dry for an hour and then lightly re-sanded it with 320 to remove any fuzz. The “recipe” I’m following is generally what is suggested in Glen D. Huey’s “Finishes that Pop” video, although I skipped the glaze and took a few small shortcuts. 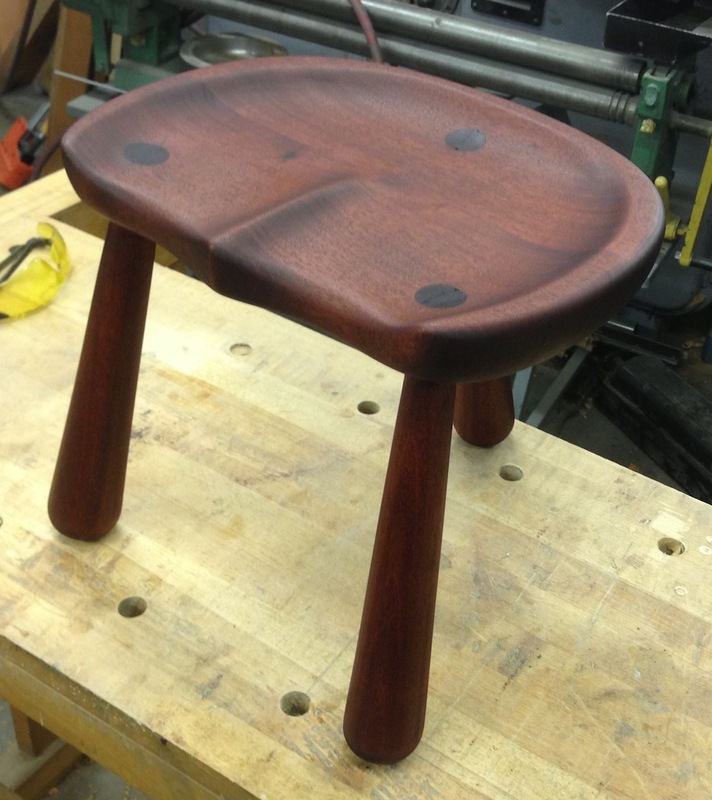 After raising the grain I slathered on a coat of Dark Red Mahogany water dye that I mixed up. I wet the surface and kept it wet for a minute or two, then wiped it dry. Glen Huey, in his “Finishes that Pop” video recommends 5 minutes, but I believe his justification is for highly figured woods. This isn’t, and I was in a hurry. I tend to rush finishing, I need to slow down at this stage but I’m always eager to see the final product. This is the same dye I used on my Winding Sticks, but I diluted it slightly more. I let that dry for an hour or so, and applied a coat of boiled linseed oil. Just plain hardware store stuff. The idea behind the oil is twofold as I understand it. First, it helps accentuate the figure – in this cast there isn’t any. Second it helps prevent the shellac pulling the dye back out of the wood and lubricates the brush or pad while applying the shellac. The oil coat should probably dry for at least 24-36 hours. I googled “drying time for boiled linseed oil”, and found a thread on the SAPFM that talked about being being to overcoat it with shellac immediately…so I after an hour or two I applied the first coat of orange shellac. 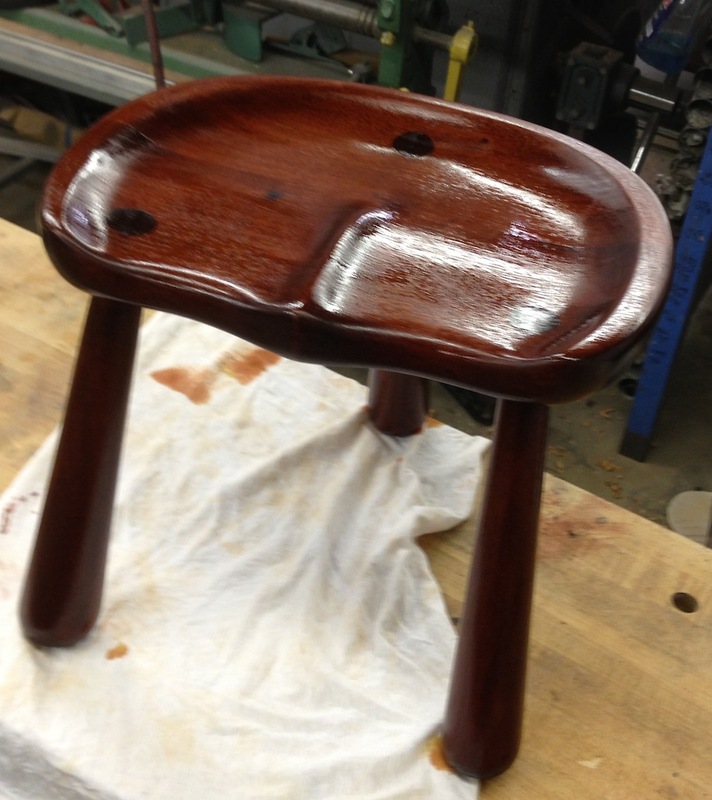 In the end I applied two coats on the legs and underside, and an extra coat on the seat itself. I didn’t dilute the shellac, but I de-nibbed with a white synthetic pad between coats. I sanded the seat lightly with 320 before the final third coat. I left the stool to dry overnight (I had to get to the 1:00 am meeting, after all). After my 8 am meeting today I rubbed it out with 0000 steel wool, then rubbed in a coat of wax with the same steel wool. I like it. It’s comfortable and the finish has a nice warm glow. There is an ongoing emergency at work this weekend, so I’m not getting as much shop time as I’d like. It’s 1:30 in the afternoon and I’ve been on four conference calls already. I did the last one while I was sanding though. My immediate goal is to trim the legs where they stick through the seat, and clean up the shaping of the top side of the seat. In retrospect, I should have trimmed the leg tips a little before gluing and wedging. It would have been easier to clean them up, and I would have had a better fit with the wedges. Lesson learned. I tried sawing the protrusions off with a pad saw, but it was more trouble than was worth. I used a gouge to trim the end and clean up the shape. I’m not convinced that I actually have my gouges properly sharpened. In fact, I’m pretty sure I don’t. They don’t cut as well as a sharp chisel. 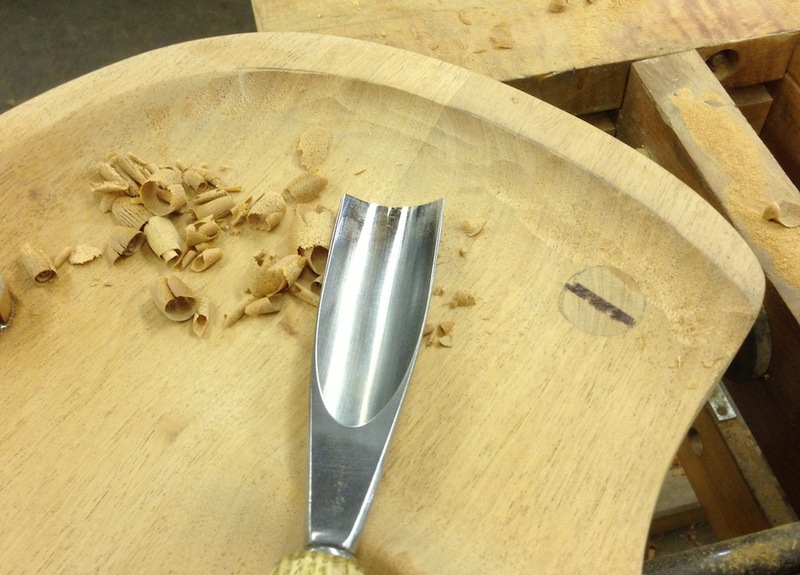 I used a scraper after the gouge to flatten out the marks, then sanded with 120. Lots of sanding. I penciled in some guidelines for rounding over the edge of seat and leg notches. I used the spokeshave to round over the edge, then blended all the facets with some 120 grit paper. I used a rasp followed by 120 grit sandpaper to round over the concave leg notches since my spokeshave won’t reach there. Then I sanded the whole thing with 220 and gave it a quick once over with 320. I sprayed it with water and wiped it down to raise the grain. I’ll go over it with 320 lightly and start applying finish this afternoon. 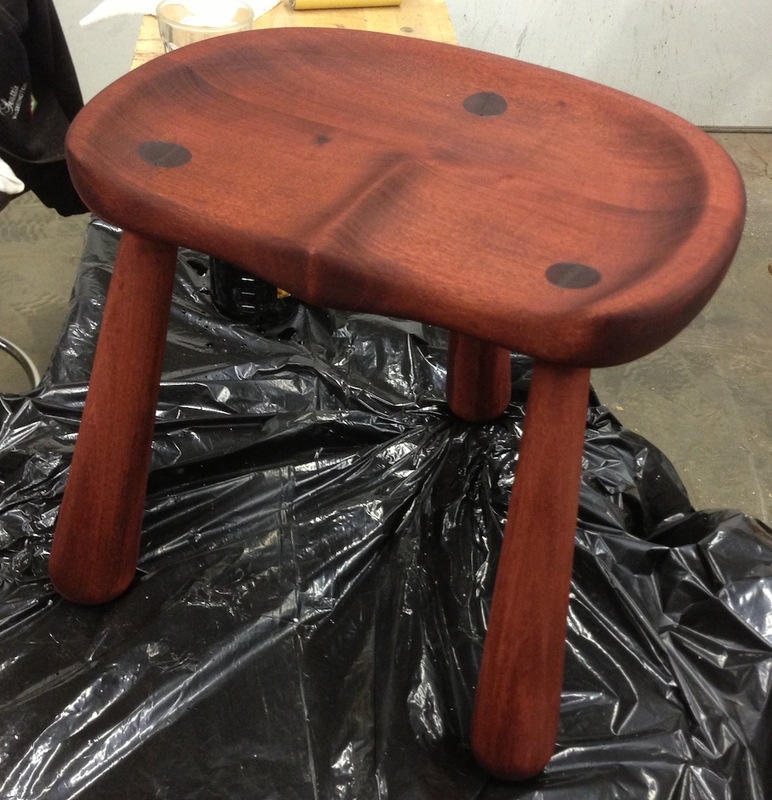 Crazy week at work, but I got a few hours in this week on my stool project. 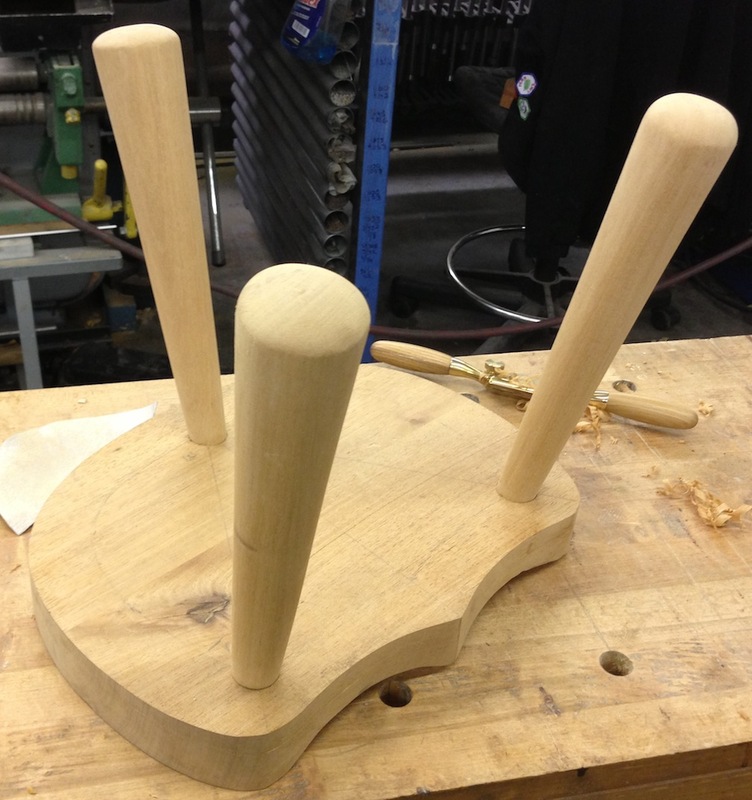 I had the parts all roughed in last weekend, but they needed fine tuning. 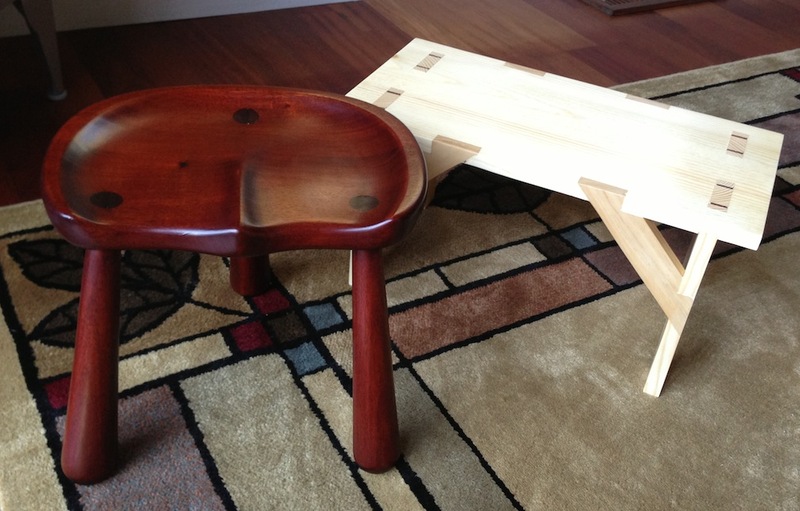 The first problem was the fit of the legs into the holes – from the top side – wasn’t great. My plan was to carefully shave the legs down so they stuck through further and hopefully end up with a better fit. The second problem was the shape of the sides of the seat itself. Not so much a mistake, as something I just hadn’t addressed yet. Too klunky. 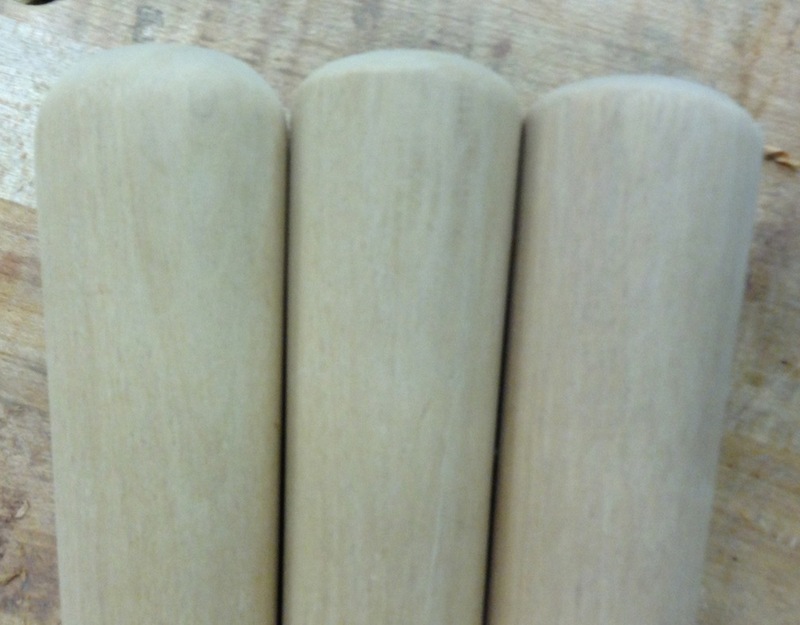 And finally, the ends of the legs are all slightly different shapes. Time to get to work. I started with the ends of the legs. 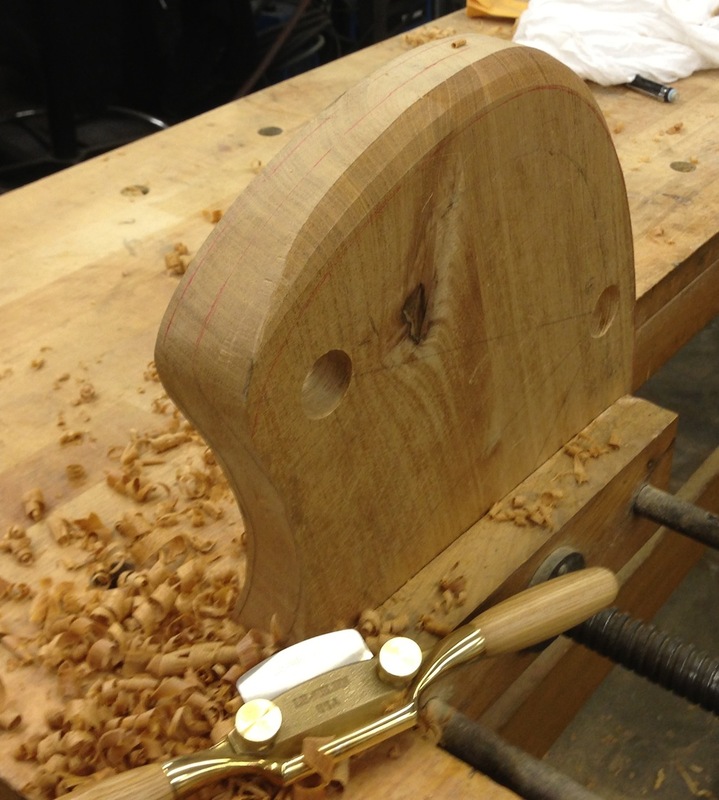 I penciled in some fresh guidelines and went to work with the spokeshave. I really like the LN spokeshave. It puts the Record 151 that I previously had to shame. 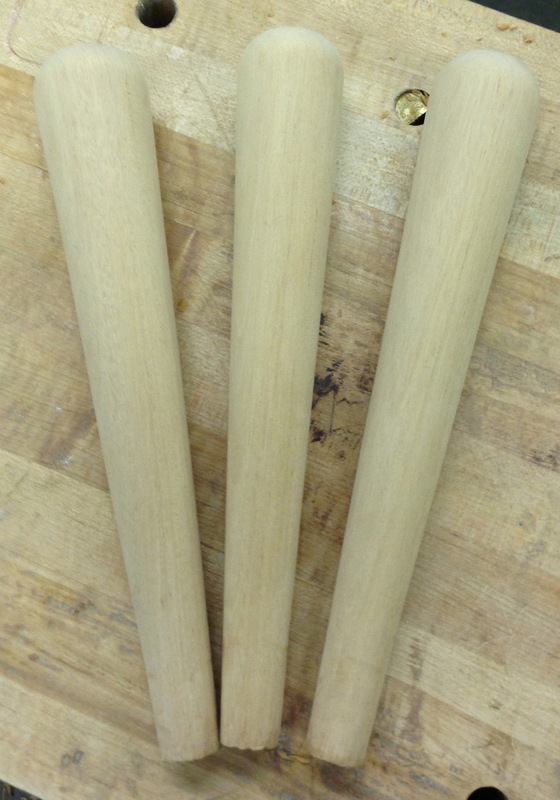 It took some back and forth, shaving, sanding and shaving a little more here and there, but eventually I got all three legs passably close to the same shape. I also shaved off the high spots where the legs fit into the seat, and sanded them through 220. Next I drew in guidelines to help shape the seat. I decided that the final shaping on the top of the seat will wait until after the glue-up as I have to chisel off the leg protrusions anyway. So I’m focused on smoothing the underside and visually lightening the shape. 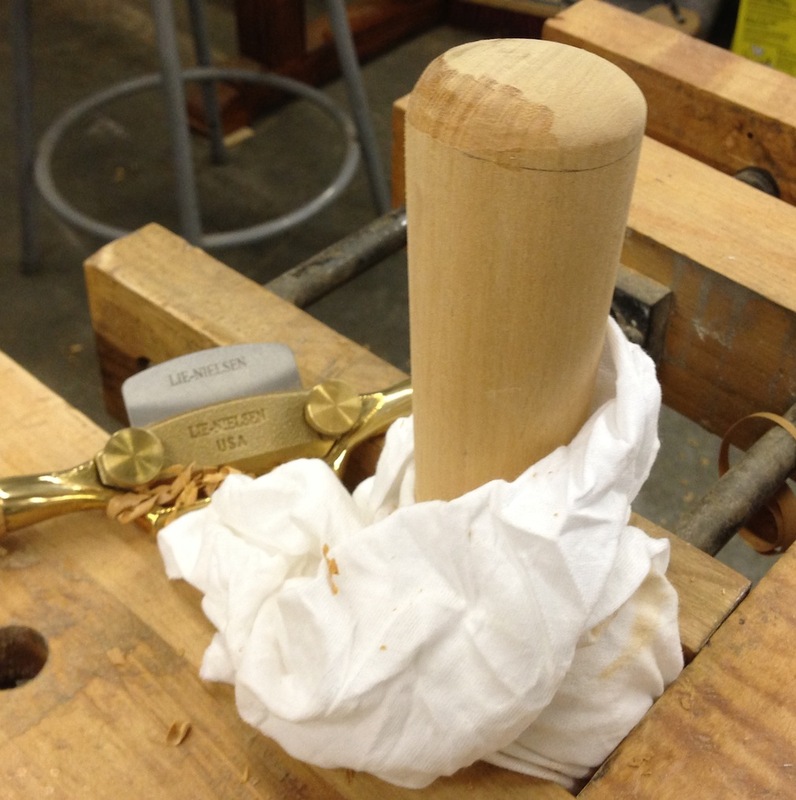 I clamped the seat in my vise and went to work with the spokeshave. 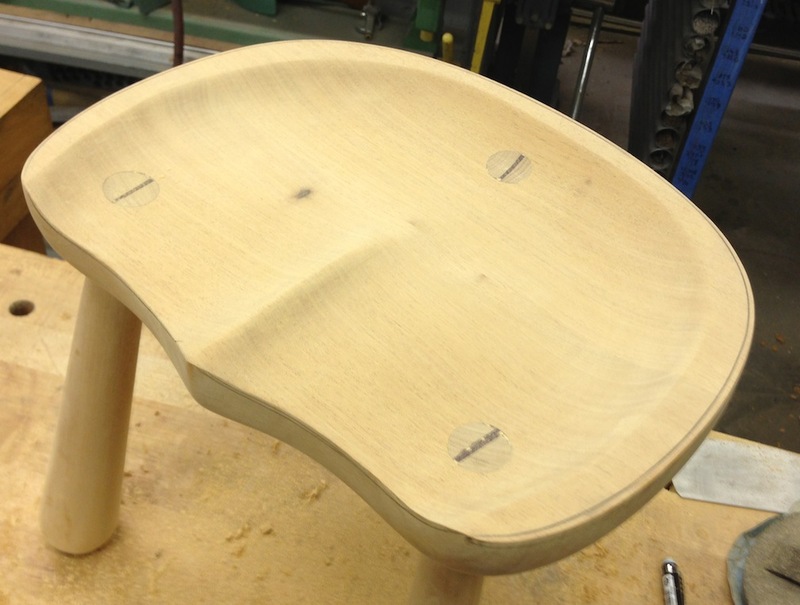 I worked all around the seat, rough shaping first, then worked around it again to fine tune the shape. I really need to prioritize finishing my new workbench, this one is terrible. I lightly went over the edge with a fine rasp just to smooth out any weird spots, and also to get into concave areas like the leg notches. I guess I need to get the round bottom spokeshave now. 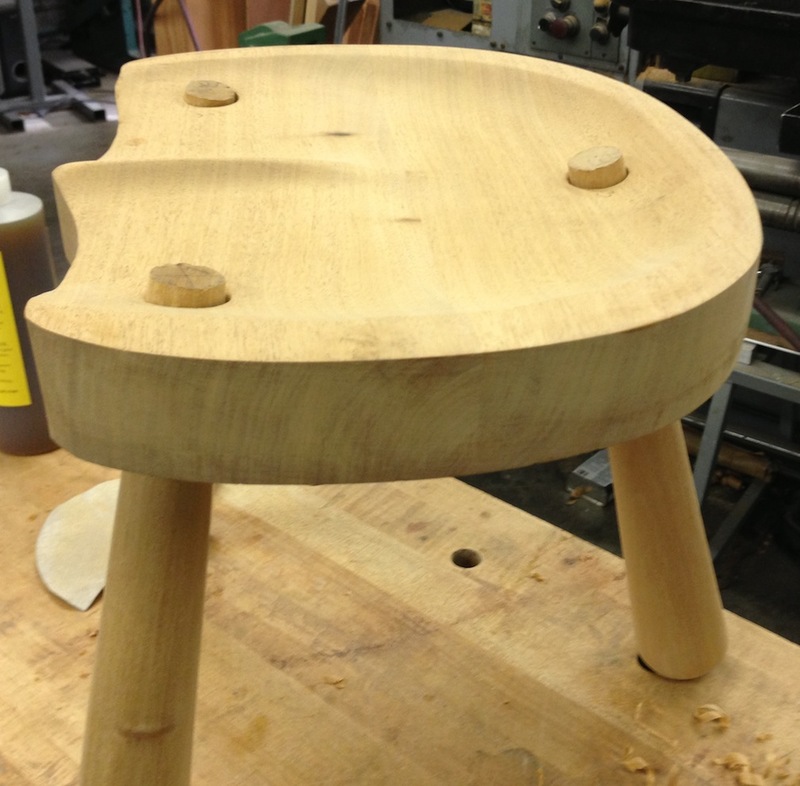 Here is the bottom of the stool with the legs and seat sanded through 220 and dry fit. Ready to glue. I decided to try liquid hide glue, I ordered some “Old Brown Glue“. I read the instructions (!) and heated it to about 140 degrees. I don’t have enough experience with the product to say how well it works, but I like the company. I ordered a 20oz bottle and a pound of dry hide glue flakes. The shipping was slightly less than the website calculated, so they sent me an extra 5oz bottle. 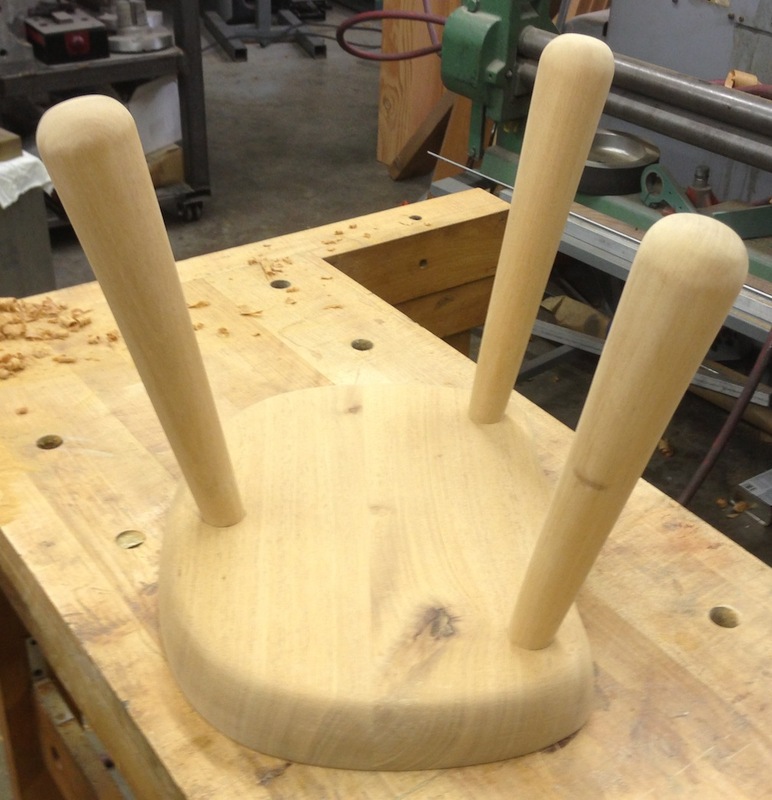 So, the stool is glued and drying as I type this. Tomorrow I’ll chisel off the tips of the legs, clean up the shape of the seat and sand everything through 220. I’m going to wet it to raise the grain and re-sand it. My plan for finishing is dye stain, oil and then shellac. It’s very bland looking at this point, although it is “genuine mahogany”. 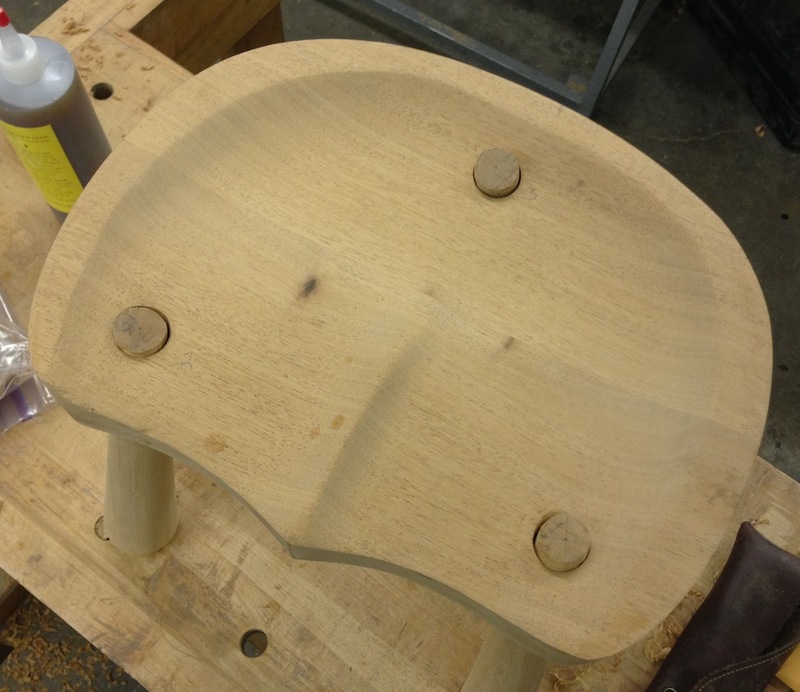 I took a break from hauling junk to the dump today and spent some time working on my stool. I’d hoped to get everything fabricated and glued up, but the legs took longer than I’d expected. It would have been faster to turn them on the lathe of course, but the point of this exercise is to develop my hand tool skills. 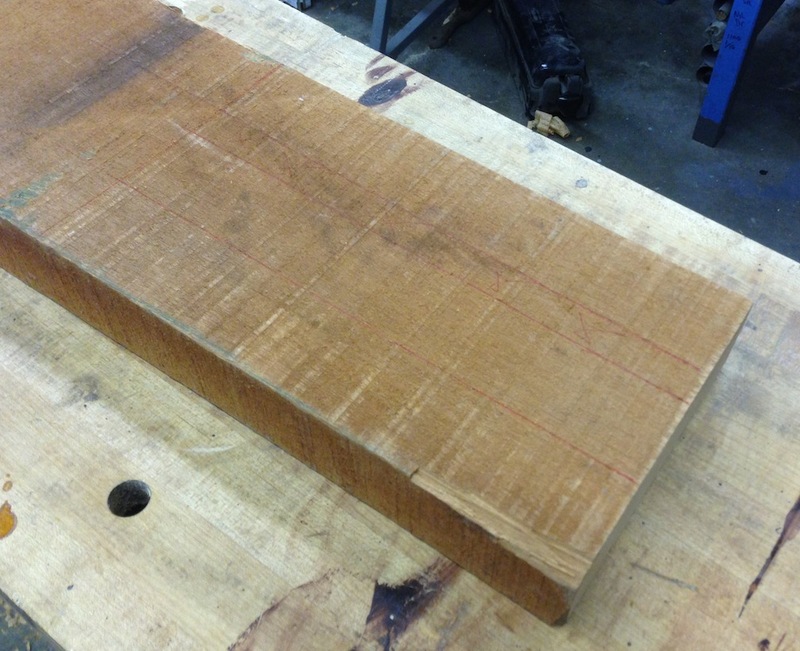 I started with a rough sawn plank of Mahogany I pulled from the off-cut bin at Global Wood in Santa Clara. 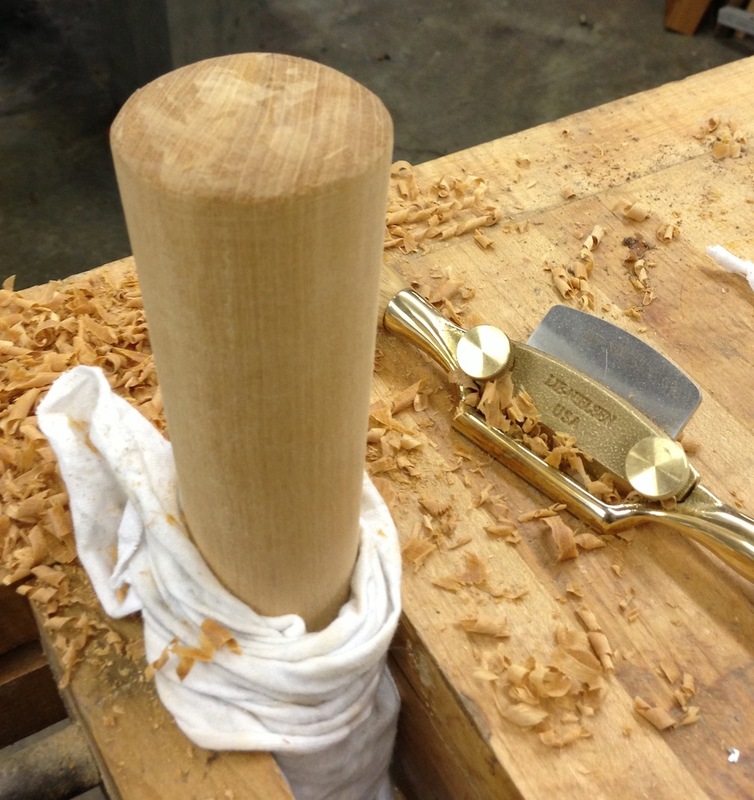 It has a crack at the other end, but there was plenty of material for making three legs. I marked out the cuts with a red pen. And band-sawed them out. I need to replace the blade in my saw, it got a kink in it and now leaves a really jagged cut. But it’s fast. 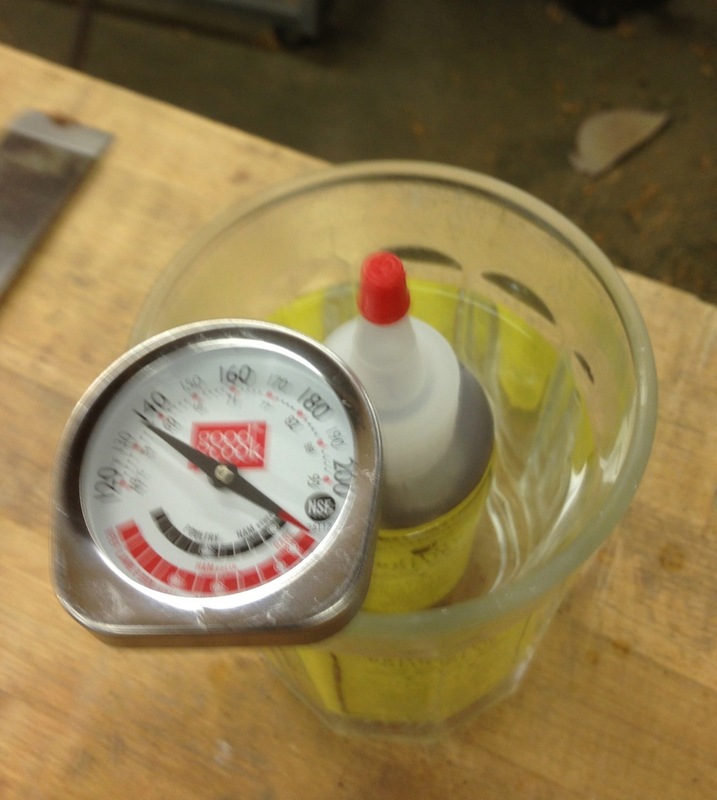 Next I laid out a 2″ diameter circle on one end and a 1″ diameter circle on the other. I’m taking a few liberties with Paul Sellers’ dimensions, but I’m never been good about following the rules. 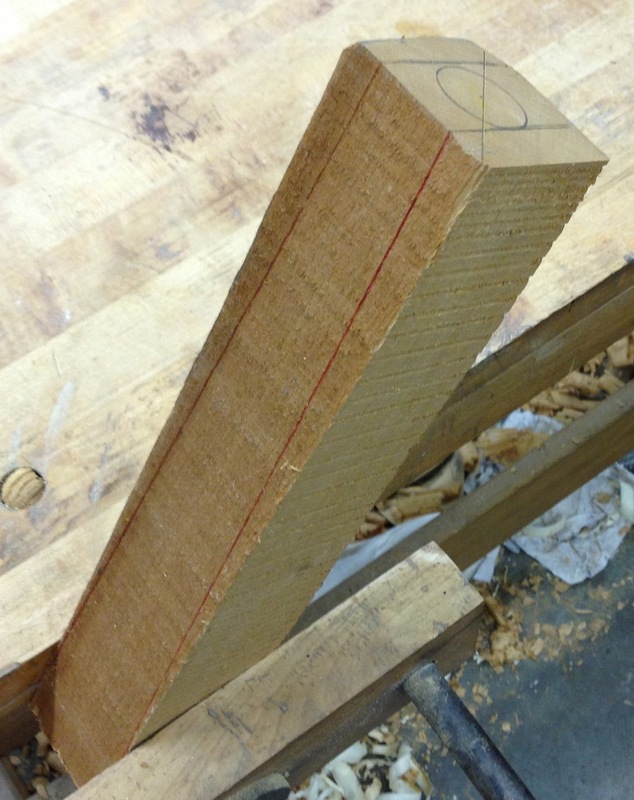 Then I laid out taper guidelines on two sides of each piece, and planed down to the line. After planing all three legs into tapered squares, layout more guidelines to turn them into octagons, and plane off the excess. 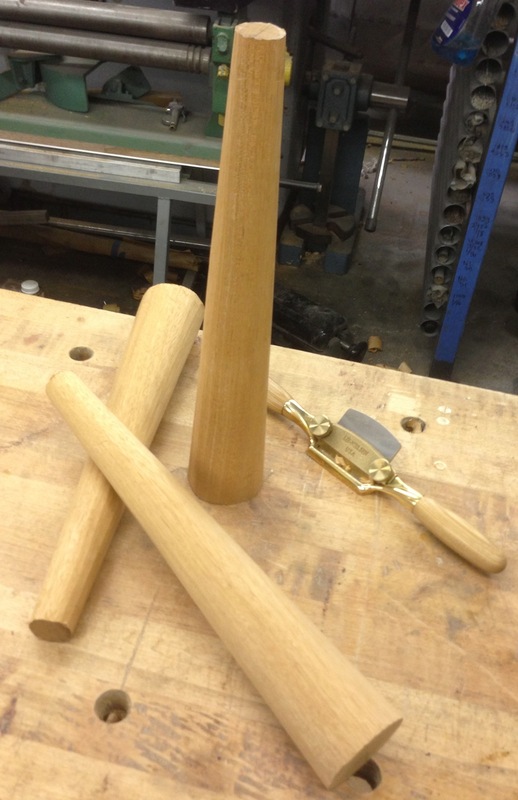 Finally, finish them off with a spokeshave. There are still some facets left from the spokeshave, but at this point I started working on fitting the legs into the holes. I pushed a leg into a hole, then pulled it out to see where it was bruised. I spokeshaved off these high spots and repeated until I got a reasonable fit. 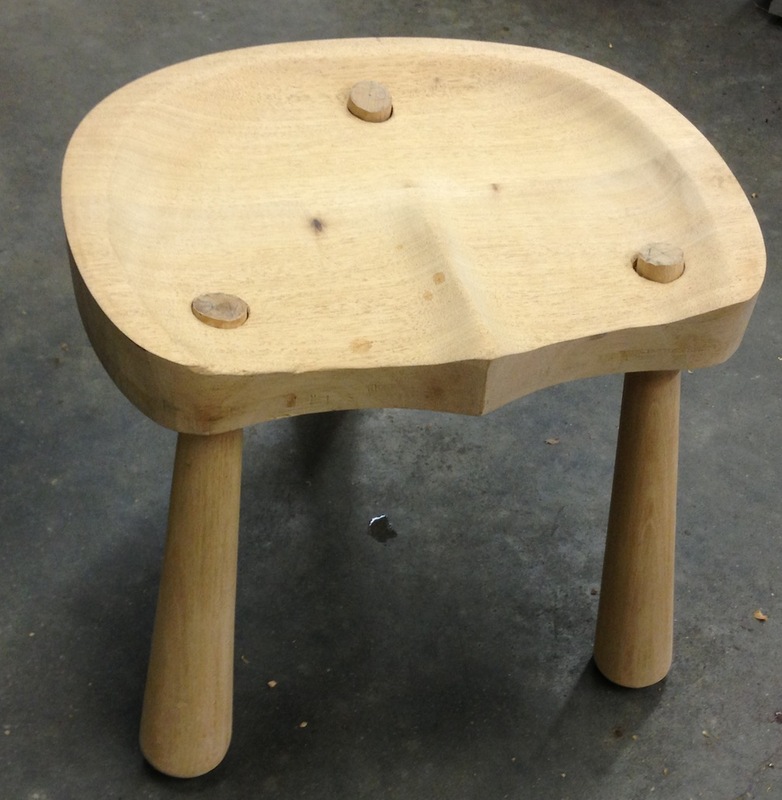 I took a little too much off the tip of one of the legs, so that might be a problem with the finished stool. Water putty? 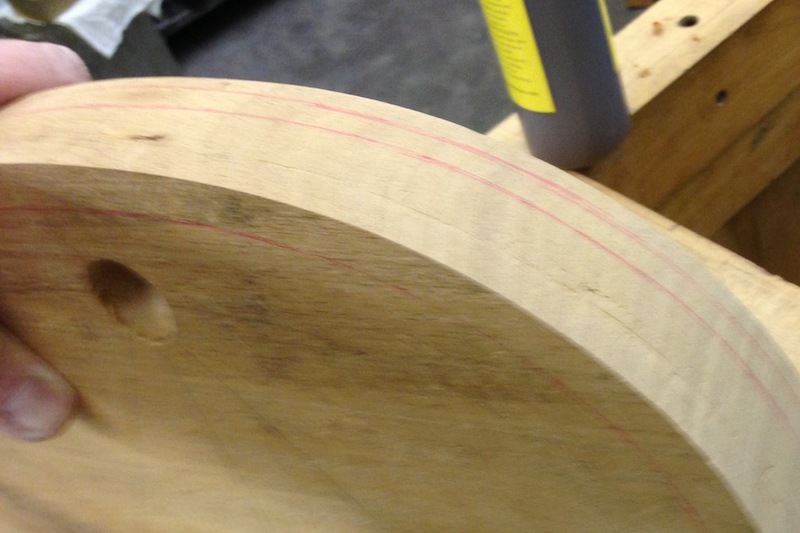 Then I penciled in some guidelines on the fat end, and spokeshaved the ends round (ish). Once this was done I sanded the legs with 120 grit paper to remove the facets and smooth everything out. I avoided sanding the small end so I wouldn’t mess up the fit. I have some more detail work to do before I can glue the legs in. Sanding the bottom of the stool, cutting chamfers around the edges with the spokeshave and just generally double checking everything. 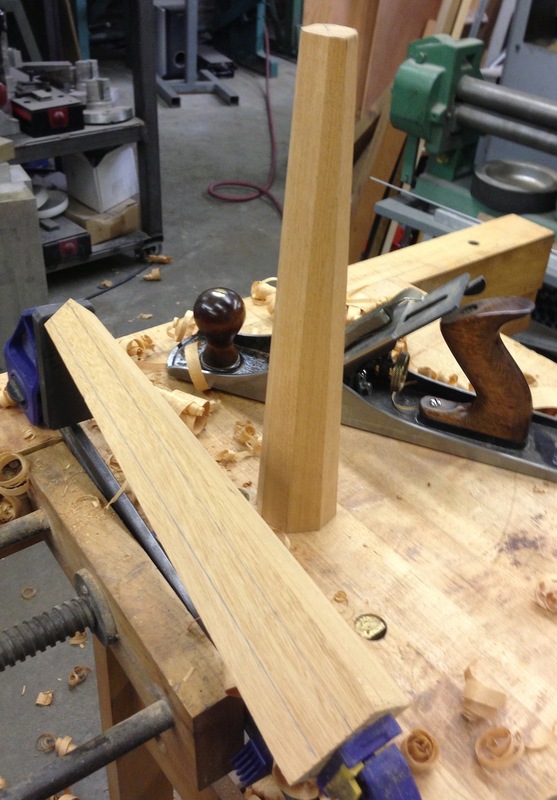 The leg tenons get a saw kerf and are wedged at glue up time. I’m going to pick up a bottle of liquid hide glue for this project. For the finish I’m thinking of using a water-based dye, followed by oil and then shellac. So, I should be working on my workbench project. 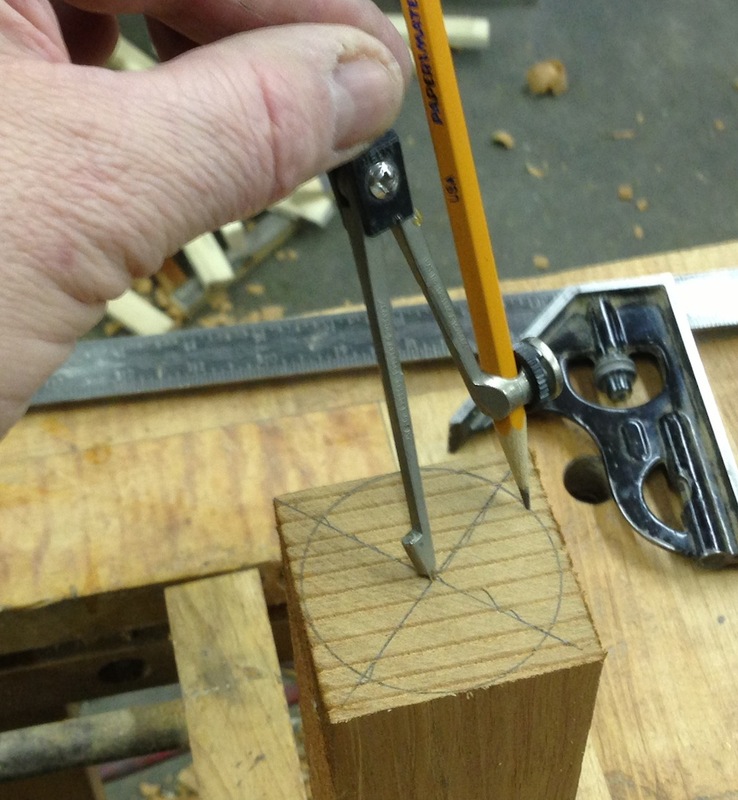 But I’m putting off dimensioning the stretchers, which is the next step. I really like working with hand tools, but when it comes to mundane stock dimensioning I think I might like to go power. Scandalous, I know. I have some odds and ends of wood that I’ve collected with a few specific projects in mind. 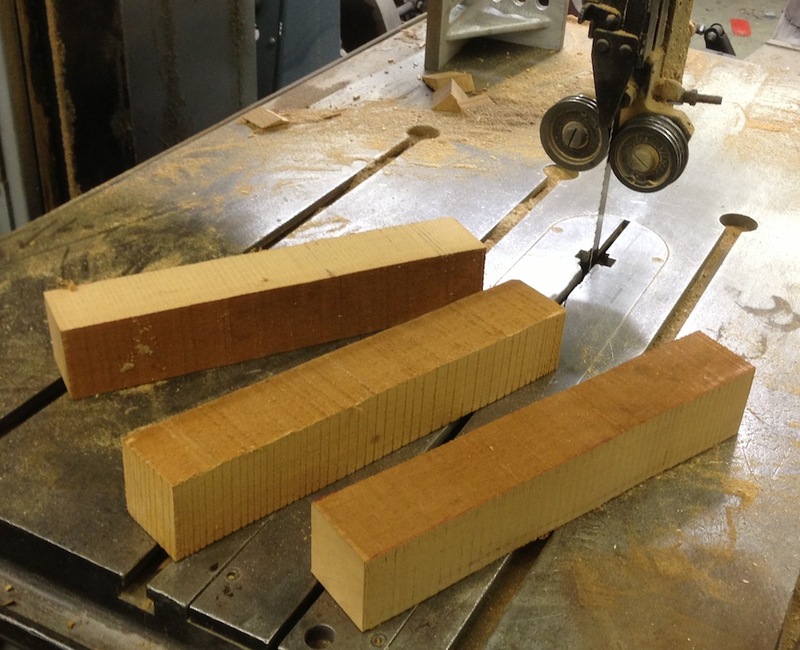 In particular I have two short pieces of 8/4 mahogany from the off-cuts bin at the local wood store. 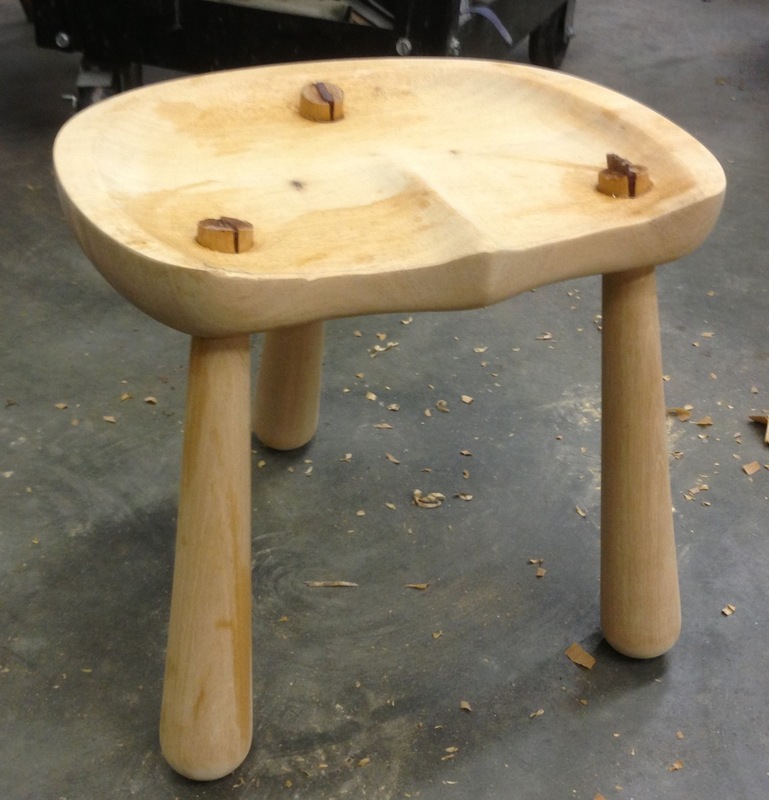 My plan is to make a small three-legged “milk stool” as shown in Paul Sellers’ book. This has a couple of good things that I need to practice. 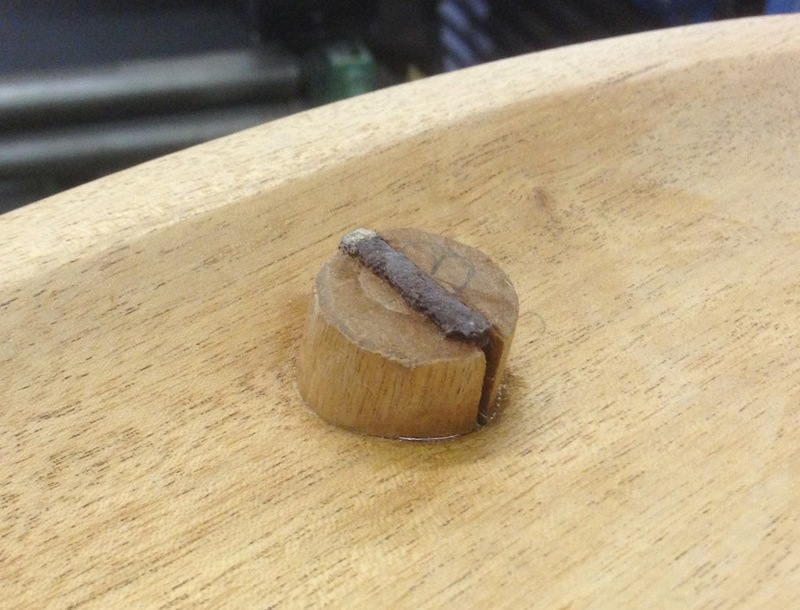 First, using a gouge to hollow out the seat. 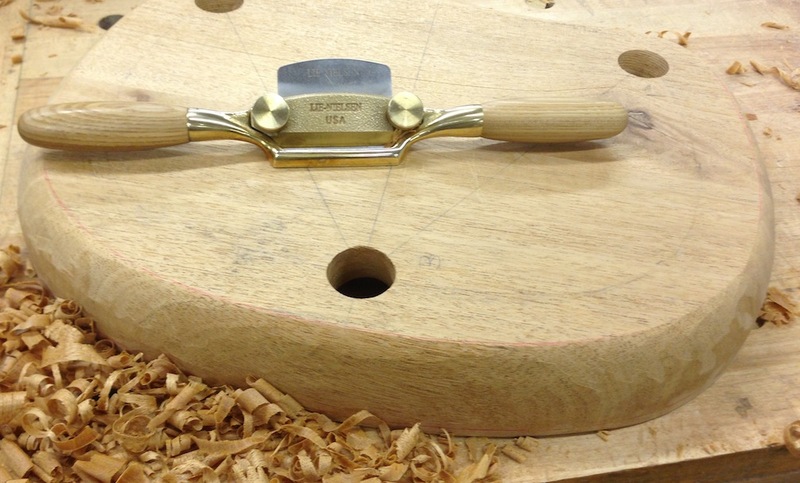 Second, using a plane or spokeshave to make round tapered legs. First things first, I cross cut, edge planed and glued up one of the scraps to make the seat. Flattening the first side was easy, but for some reason I really struggled with getting the second side flat after I’d thicknessed it. I did just what you’d expect – scribed a thickness line and planed down to it. That took about two minutes. Then I spent another ten minutes chasing out highs and lows so it would lay flat on the bench. Then I made a fancy pattern for the seat shape. I have using corrugated cardboard for patterns, but it was all I had on hand. 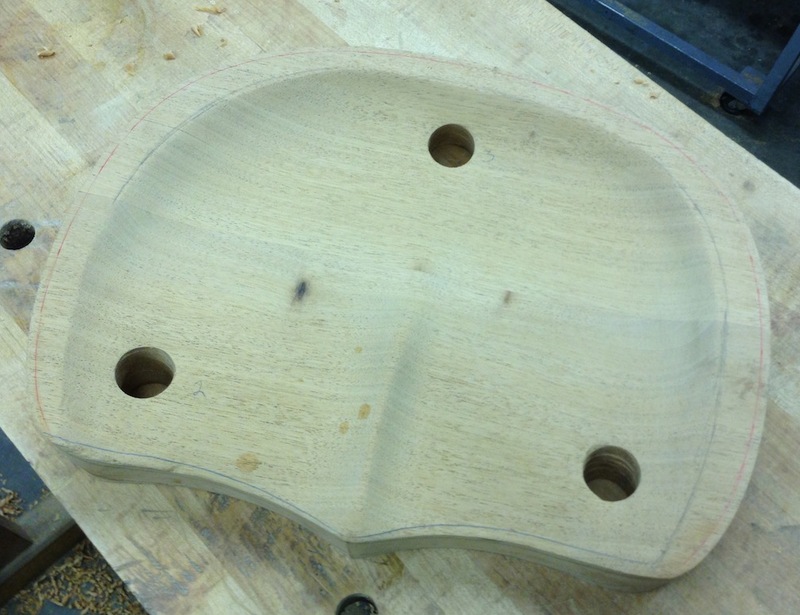 I laid out and drilled three angled 1″ holes (using my bit and brace, thank you very much). Kolya was using it to make his tool rack, and it turned out my bit was really dull. I sharpened the spurs and cutters with a small file and it cuts like gangbusters now. Then I got out my gouges and started hogging off material. I had some problems with tear out in the deepest section, where the curve is the tightest. Lighter cuts, and rolling the gouge through the cuts seemed to help with that. I switched to a flatter gouge and used lighter cuts to clean things up. And then a flatter gouge still, followed by 120 grit sandpaper. The contour is OK, but it’s not as even as it should be around the periphery. I’ll work more on “even” next time I get into the shop. And make some legs for it.